Our stunning French Oak Wine Barrel Entryway table cabinet is a fine work of art. Robust and rugged barn hinges coupled with wrought iron latch convey a barrel that could have been used in the 12th century. Large door and shelf allow for maximum storage. Great place for keys, phones and other daily incidentals.It includes a door and shelf. It measures about 35" height by 14" depth at the girth, and the top is approximately 22" across with an 11" depth. 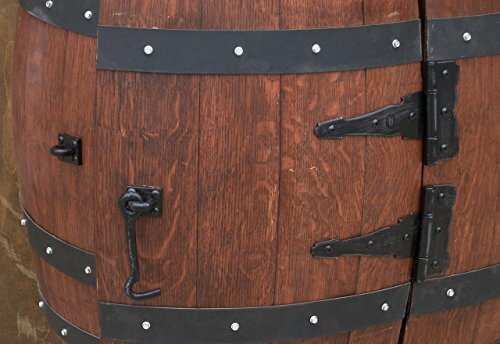 Why French Oak Barrels? Barrel-destined oak trees ideally grow in cool climates, which gives them a chance to mature slowly and develop a desirable tight grain. Most of the French oak for barrels comes from one of five forests, some of which were originally planted during Napoleonic times for shipbuilding.